At present, I cannot say which line of JACKSONs these ones may be related to. These ones resided in the southern part of Co. Kildare. One of the tantalizing clues that might tell us more about them is a family crest that contains a horse (see Detailed version of family tree - a file which I have not updated). There are also JACKSONs still residing in some of the same townlands. They may turn out to be related. 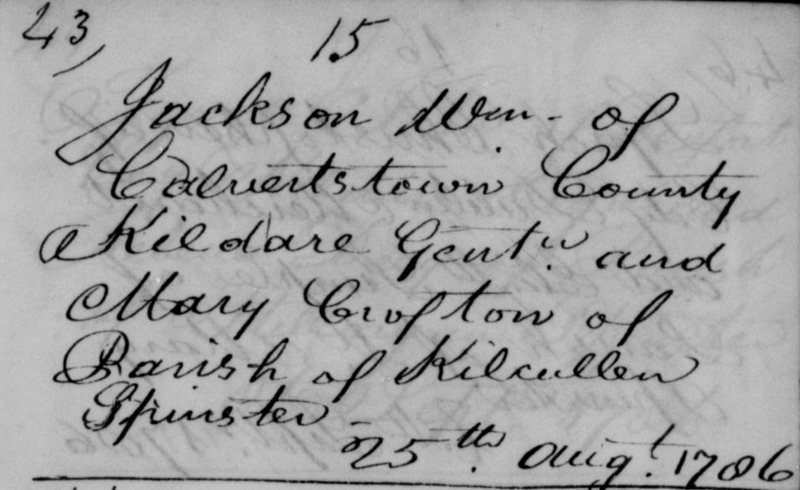 These JACKSONs listed beneath, from Co. Kildare, are now included in the rootsweb version of my own family tree. This makes them earlier to search and see the sources, and for updates to be added in the future. My interest in this line of Jacksons is not because I am related to them, but because Sir Thomas Jackson (1841-1915) had a farm in Co. Kildare in 1890, and I still don’t know where it was. Nor do I know how he may have come to own such a farm. My best guess – or hunch – is that there may be a link between him and some other Jacksons of Co. Kildare. Possibly thisa line. 1 Thomas JACKSON b. in England d: 1690 + Elinor GREEN b: Abt 1669 possibly b. Limerick. 6 Ann JACKSON b: 15 Jan 1864 probably Killenane, Parish Kilcullen, Co. Kildare. 6 Mary Elizabeth JACKSON b: 23 Apr 1867 probably Killenane, Parish Kilcullen, Co. Kildare. 6 Maria JACKSON b: 1 Mar 1877 probably Killenane, Parish Kilcullen, Co. Kildare. 6 Louisa Jane JACKSON b: 1 Mar 1877 probably Killenane, Parish Kilcullen, Co. Kildare. 6 Benjamin James JACKSON b: 31 Aug 1873 probably Killenane, Parish Kilcullen, Co. Kildare. 6 William Frederick JACKSON b: 6 Jul 1871 probably Killenane, Parish Kilcullen, Co. Kildare. 5 Samuel JACKSON b: 12 Feb 1809 Davidstown, Co. Kildare d: Jul 1858 Davidstown, Co. Kildare. + Elizabeth BROWNE b: Abt 1810 of Castledermot, Co. Kildare d: Abt Mar 1848 Ballybarney, Davidstown, Co. Kildare. 3 Thomas JACKSON NOTE: He may be the Thomas JACKSON of Davidstown who died intestate in 1810.